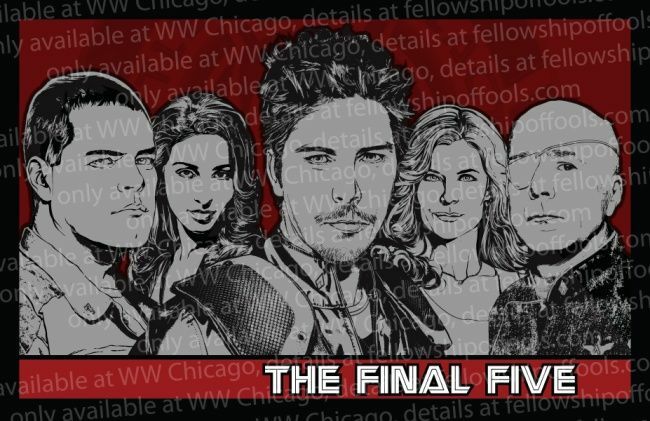 You may remember awhile back that I posted a link to a video of Aaron teasing about “something” Final Five related that they had planned for the Chicago Wizard Convention in Chicago in August. You have seen Aaron Douglas tease it in the video above and then again on the FoF for a special appearance a few weeks ago. The time has come to let everyone know about the surprise that we have in store for you in Chicago. As you already know, Battlestar Galactica’s Final Five will be doing their first appearance at the same time to meet with their fans. To mark this special occasion, we have worked to create something special and VERY limited. A numbered, 11×17 print of the Final Five pictured below. The print was done by artist Brian Denham and will ONLY be available at Wizard World Chicago at Aaron Douglas’s table. There will be 300 made and they will be numbered. This will be first come first serve in Chicago. The cost of the print is $75, autographs are not included. All five actors will be at the convention and will be available to autograph for an additional fee. When these are gone, they are gone so make plans now to get yours. The image is watermarked and the watermark text won’t be on the actual print. UPDATE (August 19th, 2010): Aaron will only be appearing at the con on Sunday due to filming HELLCATS (details here). In Aaron’s absence on Friday and Saturday you can pick up the print from Froggy Photos. If there are any prints left after Saturday, they will be at Aaron’s table.